No one in Bollywood makes musicals anymore. I don’t mean films with songs added. I mean the big theatrical type, where the music and lyrics are so woven into the narrative that the film couldn’t work without it. 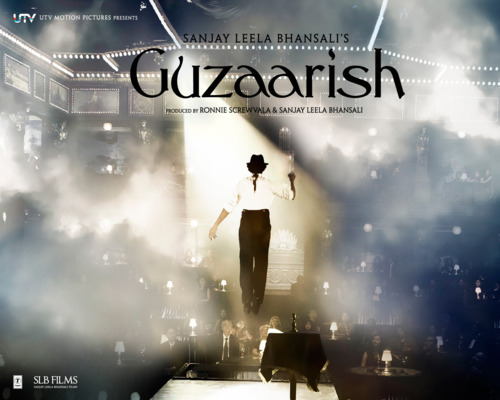 The last I saw that in an Indian film was Sanjay Leela Bhansali’s Saawariya, and now he does it again with Guzaarish. I won’t go into Saawariya much, as this review isn’t about that, but it’s probably useful to know I’m one of the few people who really likes it. It’s quite a misunderstood gem of a film. Following Black, and opening against Om Shanti Om, people expected more of a Hum Dil De Chuke Sanam than a toned down, blue looking Devdas. People need to give it a chance. Guzaarish is grand but SLB still isn’t back to his Indian epic scale of HDDCS and Devdas. He may never go back there. Instead he’s made a tragic story of a quadriplegic man who wants the right to die. It’s quite a heavy topic, euthanasia, but it’s not all about the case. It’s also not all about his illness. Neither is it all about Sofiya’s love for Ethan. It only touches on all these points, giving glimpses of the end of Ethan’s life. The lack of a solid storyline will probably be a massive negative in the eyes of most of the audience who go to see this, but it actually gives more time to character growth, and just to watch SLB do what he does. Hrithik Roshan is exceptional as Ethan Mascarenhas. He’s a flawed character, but its taken fourteen years of suffering for him to get to that point, and you really feel for him, whether or not you agree with what he’s fighting for. Hrithik chemistry with Aishwarya is brilliant. What the two of them together do on screen would never have been as good with any other two actors. It was nice to see her looking simple and elegant, especially after the costume nightmare that was Action Replayy. The little bit of weight she put on takes nothing away from how good she looks. No one’s hair has ever irritated me more than Aditya Roy Kapoor’s afro. He has potential as an actor, but I don’t know if we will see him as a lead, especially not with that hair. He did well given that the role had no real point to it. SLB added the little twist towards the end, but didn’t really take it anywhere, and so it just became a bit pointless. I was more than happy for him to just be the enthusiastic fanatic who had come to learn magic. Not giving the character more would have avoided the disappointment I felt when nothing came out of the revelation. The music is good, and works well in the film, the two high points being Tere Zikr, and Udi. My biggest issue with Sanjay Leela Bhansali is putting songs in the album, making me love them and then leaving them out of the film, and he did this with Saawariya as well. One of my favourite songs from the Guzaarish album is Chand Ki Katori, but it was nowhere to be seen, or heard, in the film. There wasn’t really a point where it could have gone (where as in Saawariya I know exactly where and how I’d place the songs he’d missed), but nevertheless, I felt I had been cheated. Being the massive fan of SLB that I am, my view of Guzaarish is probably a little biased, but I do think if people gave it a chance they’d see it really is a wonderfully sweet film. Its sad, but not depressing, and it leaves you with a warm feeling, which is unexpected from a Euthanasia film. I hope there are enough SLB fans out there like me, or lovers of the Hrithik-Ash jodi that will make this film work because I truly believe it deserves to.